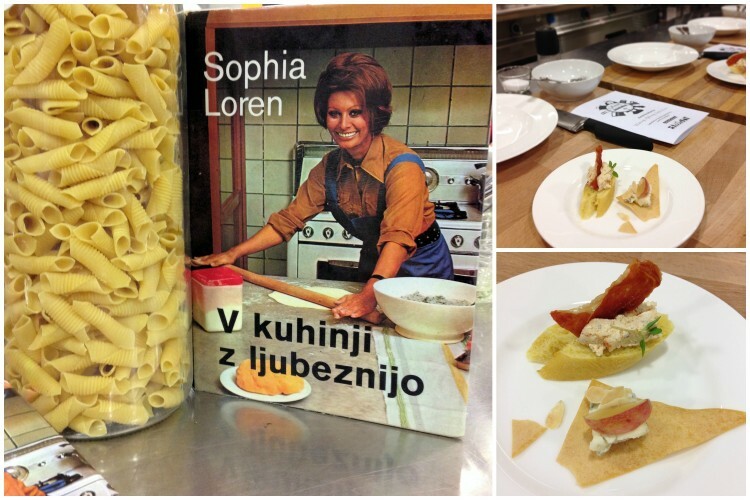 I got the best possible gift – a culinary workshop, titled In the kitchen with love with Sophia Loren, organized by Dvor Jezersek and led by Ana Sustersic. The only problem was that now I had to wait for two months for this workshop. All possible dates prior to mine were fully booked already. No wonder! When the much expected Thursday afternoon finally arrived, I drove up to Cerklje na Gorenjskem with great joy and even grater expectations. We were welcomed by Ana at the Dvor Jezersek Restaurant. She had a big smile on her face and a cute bow tie around her neck and she immediately took us to the kitchen. Aprons on and off we were each to our work station. Ana already prepared two delicious bites for us, “mouthwatering greetings”, as she called them: Truffle spread with grilled prosciutto and gorgonzola cheese with almonds and grapes. 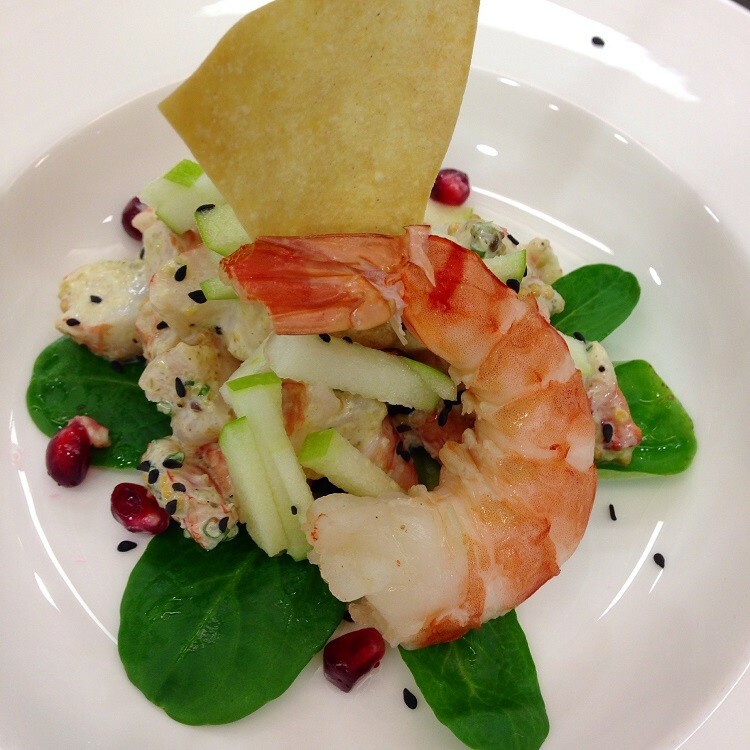 After a short introduction about the cookbook that inspired the workshop, we started with our first dish: black tiger prawns with apples. It was a delicious salad with prawns, mayonnaise, mustard seeds, lemon, pickles, capers and herbs, topped with some green apple, pomegranate and black sesame seeds. A perfect combination, if you ask me! And to my surprise, we were offered some wine to go with it. That has never happened to me before at any of the workshops. A nice touch, I must say! 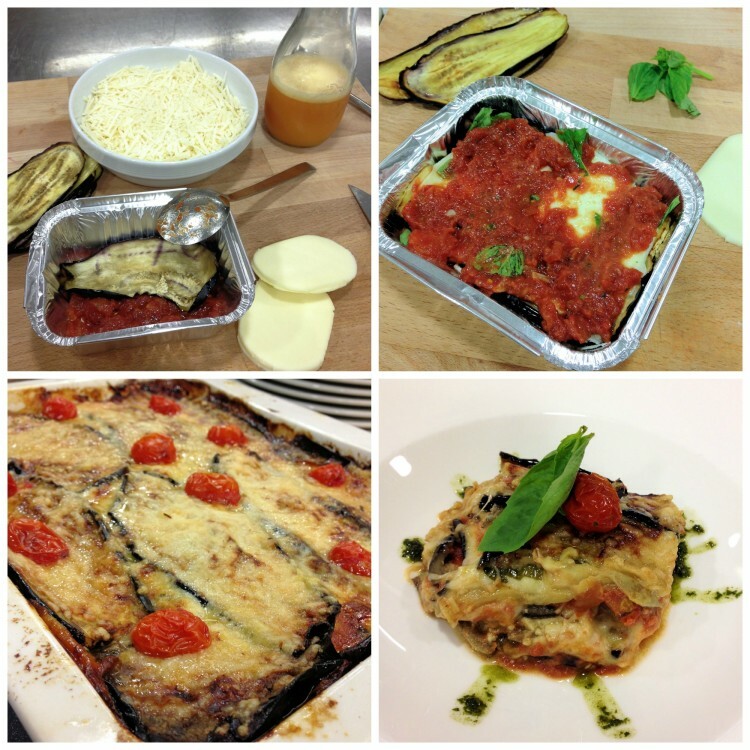 After we finished our salad and a glass of wine, we were off to the next dish – Parmigiana. Even though it is named Parmigiana, it is actually a dish from Napoli. Regardless of where it is from, it’s delicious. We made our own tomato sauce and then created layers of sauce, roasted eggplants, parmesan cheese, mozzarella, basil and eggs. Three times like this and into the oven it went. While we waited for the Parmigiana to be done, we kept ourselves busy with making pasta. 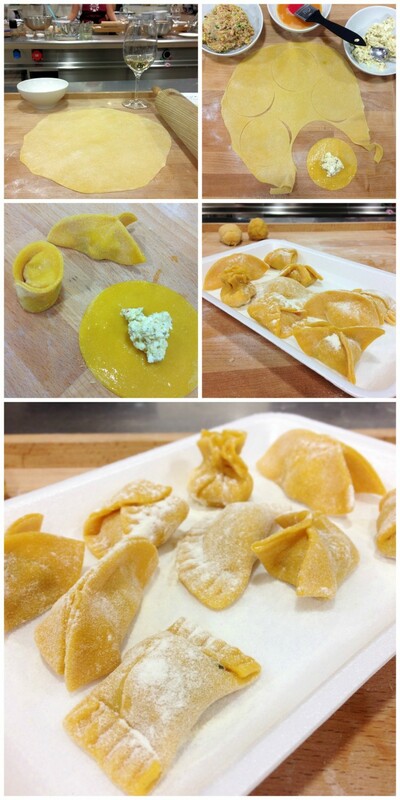 What kind of an Italian culinary workshop would it be, if we wouldn’t make any pasta, right? We started by making two fillings – one with meat (and among others, pork brain) and one vegetarian with ricotta, pine nuts and spices. Then we got creative and created all sorts of tortellini and ravioli and of course drank some more wine. The pasta was for us to take home, freeze and prepare anytime we wanted. Parmigiana was ready, so we all got to taste it (well not just taste it, it was a full grown up restaurant portion). 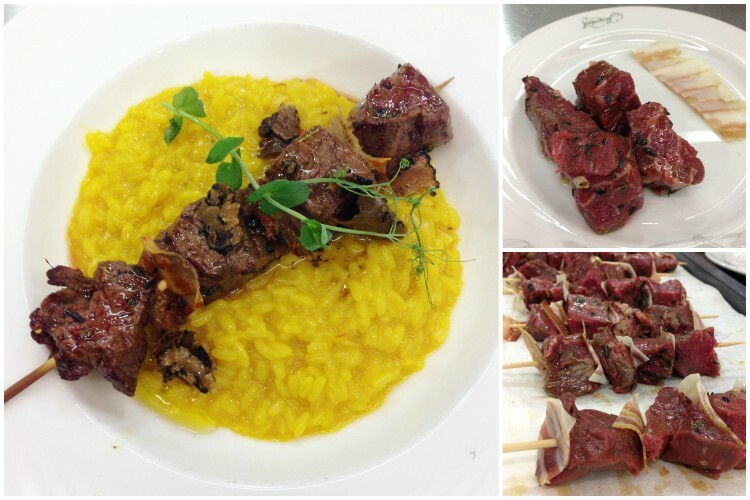 We were now ready to continue with some more delicious, mouthwatering and heartwarming dishes: saffron risotto and aged beef skewers with bacon. We learned that the key to a delicious Italian risotto is to keep adding small amounts of stock to the rice and keep mixing and mixing and mixing. Well, the saffron doesn’t hurt either but since it’s really expensive, you can skip it in your risotto and maybe add some mushrooms. Turmeric will give you the same color but the flavor won’t be the same. In the meantime, we made beef skewers with delicious aged and marinated beef and baked it in the oven to medium done. A great alternative to grilling it in a pan, especially a lot less messy. 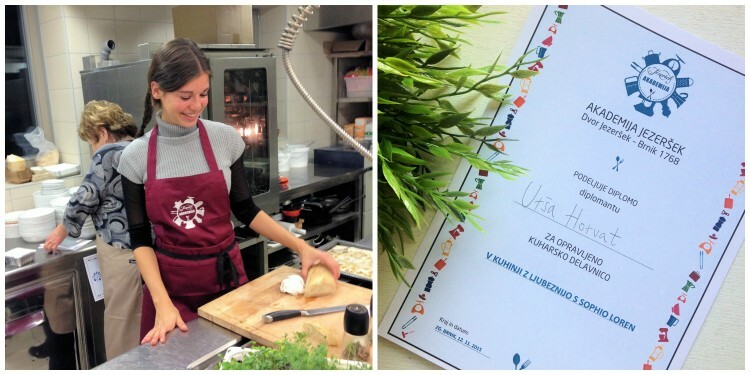 We got a few more recipes to take home and try ourselves, packed our boxes of leftover food (lots of it), received diplomas for successfully completing the workshop and left the kitchen with full stomachs, new knowledge and smiles on our faces. 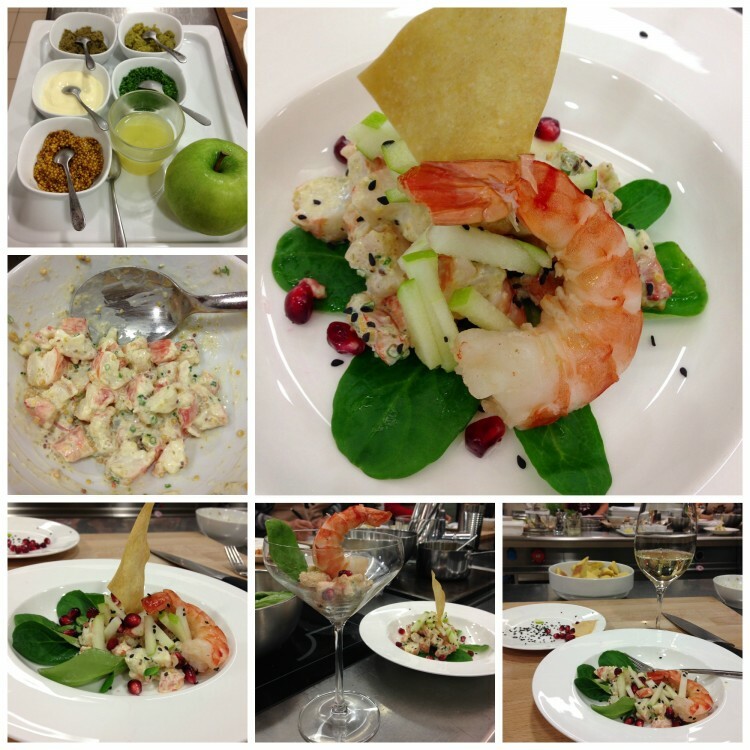 I have to say this was the best culinary workshop I have been to and I have been to quite a few. Ana was professional and you could see that she really has her whole heart in cooking. She encouraged us, answered all our questions and in general taught us a lot. You really get a lot for your money, in my opinion even more than what you pay for – the ingredients we used were high quality and some very expensive (saffron, truffles etc. ), we could drink as much wine as we wanted and our teacher was really skilled. Secretly, I’m already thinking about which workshop to take next!